Thanks for everyone who came along to support us in the last week – we really appreciate it. September has (again) been a record month for us in terms of attendance (our busiest ever September in terms of people through the door) and we are really thankful to all of you guys…and more than a little bit impressed with the dedication each of you has been showing. This week’s blog is 100% based on the outcomes of the survey that went out during the week. As is tradition with these things, you will see every response we have received in full (spelling errors included) together with a response from us…I hope that makes sense? If it doesn’t, well, I am pretty sure it will as soon as you start reading! So – the results were fairly compelling and we will be keeping the Rolling Thunder sessions in the short-medium term (at least). I will be making the updates to the online time-table in the next few days. 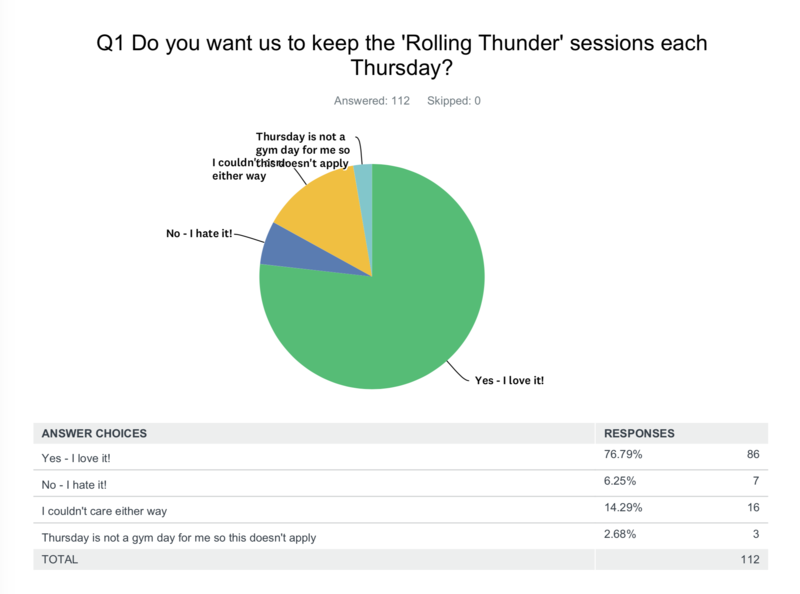 Question 2: Is there anything you would like to share with us about your ‘Rolling Thunder’ experience (why you chose ‘I LOVE IT’ or ‘I HATE IT’? Answer: I don’t feel the pressure to rush and make it for the scheduled time – it is whenever I get to the gym. Response: OK – that’s great. I hope you don’t feel TOO much pressure to arrive ‘dead on time’ though. The reason we introduced the individual warm-ups was so that if you are running a couple of minutes late, you could get to the gym, get your gym gear on, do your warmup…and get started. Sure – I understand that isn’t going to work if you are arriving 30-minutes ‘LATE’, but reading through the responses I have been getting the impression people are stressing out about being 5-minutes late…particularly those coming after work, we understand there is traffic…and we are going to give you a bit of a hard time but that is supposed to be ‘fun banter’ not a personal attack! Answer: I love the fact you can challenge yourself to go longer than a standard class. Response: Or…challenge yourself LESS and leave before the next bike station takes ahold! Answer: Get to do a little extra. Response: That’s the entire idea – get in when you can…then work as hard as you can for as long as you can. Response: I have a feeling there is going to be a bit of a theme here…there are individual warm-ups set up so if you ARE running a couple of minutes late, you can still come in, get your warm-up done and join in. The trainer might get frazzled for a minute or two on a busy day trying to find you a spot…but that is just ‘cos some of the classes are a bit complicated and finding a ‘spare spot’ is not always as simple as ‘1-2-3’. But – don’t miss a workout because you are 5-mins late. Response: Awesome. That’s what the idea was. Response: Thursday’s are a busy day…to be truthful, everyday is a busy day! Response: It sure does give people the chance to keep pushing a bit longer…that extra 15-minutes can really make a difference over a period of 2-3 months. Answer: Coming to a session just about every day, it’s good to have one day where there’s a bit more flexibility around start and end times. Answer: Suits my work, buisness and family commitments. Response: Which is the whole idea! Response: LOL. Pretty sure the ‘extra’ rounds we do are the ones at the end…sometimes you win, sometimes you lose! Response: You’re a poet and didn’t know it! Response: Always good to get that extra session in. Response: Nice. Whether it is 10-minutes more or 10-minutes less, the idea behind the class is to make the schedule suit your day. Response: Some people are pretty violently against it – and I get that…the lack of a defined start and end time can really impact on peoples motivation. When you say it doesn’t make any difference to people, well…welcome to my world. Somethings that you think are ‘small’ differences cause mass conflict and complaints…then you change something else that DOES seem like a major change – and no-one ever mentions it. Answer: Enjoy that you can do the standard lap.of the gym or more if you want and also the oppurtunity to get in and out 5 or 10 mins earlier or later than usual. Response: Standard lap? We have been primarily doing Rolling Thunder as 10-stations, 3-minute rounds…which would mean a lap is 30 minutes…I hope that isn’t the bench mark! Answer: It’s good having the option of getting an extra 5 or 10 minutes in.. Response: Body Work is ROLLING from 4pm! Get involved in that session, then jump aboard Rolling Thunder from 5pm. Seriously, I think the trainers would have a meltdown if there was one 3-hour, continuous circuit. 2 hours straight is more than enough. Answer: I don’t have to fear about being late to class on Thursday’s! Response: No point being ‘scared’ to run late…come late, do your warm-up, join in. No Big Deal. Answer: Love being able to turn up and slot into the class, whether I’m running early (never) or late (always). Response: Awesome…but you can’t be ‘late’ to Rolling Thunder. Response: Hmmm. You have to do your warm-up before jumping in…isn’t that ‘chill time’? I would also love to bring back 1-minute rounds every week – unfortunately, the people were voting with their feet and attendance for 1-minute rounds was more than 40% down on other days…all I can say is – people SAID they loved them, but didn’t attend the gym…and actions > words…Thursday numbers are much improved since we cancelled the weekly 1-min rounds (but I have said this more than a few times before). I love them – hence we still roll them out every few weeks. Answer: I really like the flexibility of it to start & finish at a time that suits me. Response: Cool. That’s the idea. Answer: I am used to being run through the class at the beginning, refreshing what the exercises are and getting an eyeball on what is expected. However saying this, I still find it interesting and it is not a deciding matter on if I go to the gym or not. Response: I don’t like this part of the class…we were putting up a video of the demos but the last one got less than 20 views – so clearly that doesn’t work…really open for suggestions as to how to do this?????? Answer: Love flexibilty. Wish the classes where little more varied though because fins some of it very repetive. But otherwise it’s awesome! Response: Well – fair enough. And this plays off the previous point – I have been making them as SIMPLE as possible because there are no demos and I want to eliminate as much confusion as possible…so the simplistic + somewhat repetitive programming is a result of the lack of class intros and demos…I would LOVE a solution. Answer: I don’t mind, did like the fact you could just get started and the convenience to stop when you like, or go on and do a full hour. Found it was a little disorganised however with people coming and going, thought this got better over the nine weeks as we all became familiar with the routine? Talked myself into saying KEEP IT ! Response: It is a bit disorganised. More than a bit. Think it is getting better as clients and staff get in the groove of how it works. Answer: Love it might be too strong a word but last week was my first experience and I will be back this week! Answer: I like knowing that if I snooze my alarm I can still make it in and also that if I want, I can push myself to stay on for a couple of extra rounds for a longer workout. Answer: The way you can stagger a start time or do an extended workout makes a good change up for the week. Not every day but once a week is great. Response: Yeah – not really considering this for every day. Answer: For me it’s not so much about the class, its the time . If I’m running late, the fact is I won’t miss a class. Response: Late = late. Arrive. Do the warmup. Join in. That’s why we CREATED a separate, individualised warm-up. Stuff gets in the way. If you roll up 30-minutes late, well, maybe not..,but 5-10 minutes? No-one will be that bothered. Just do your WARMUP and then talk to the coach. Answer: Classes starting at 5.15 pm would be perfect for me, however understand that is not part of the R1 DNA. Answer: With an unpredictable roster at work I often only have one time slot available to me and if I miss it then Thursday gets struck off my gym schedule. Having such a big window has essentially given me an extra day at the gym; it’s been really convenient. Response: Again – don’t stress about this stuff…NO-ONE-CARES if you are 5-minutes late to class. Just do your warm-up, mumble an apology about traffic or whatever and get started. Response: I love it gives ME the option to train for shorter and duck out right before the bikes! Answer: I’ve managed to sneak in a couple of Thursday sessions (although I cannot normally get there on Thursdays), but I do like it. Get stuck in straight away. Work out as much as you like. Doing it on a Saturday or Sunday would be good, when you often have a little extra time to do a little extra work. Response: Hmmm – not sold on the weekend thing but something to think about. Answer: It is great for flexibility as sometimes it is a stretch to make 5pm. The longer stations work well in this format. Response: We haven’t tried any stations longer than 3-minutes so far…think there are 4’s coming this week…making them too long would be hard (6’s for example) because it makes adding new starters a bit tricky. Response: Have certainly been some negative comments to me – but not too many in the survey! Response: Or the freedom to get out early, right before the bikes. Answer: I’ve come at 9am and I’ve come at 9.30am before. Got a great workout no matter what time! Answer: Good for timing for work! Response: Glad it works for you. Answer: I love it!!! I love how if I’m early or late I can jump in at anytime!!! Please keep it! Answer: have really enjoyed the ability to extend your workout if you want to with the same intensity the classes provide. I don’t see any negatives to it from a customers perspective, if you want a 45 min class workout roll in and do it. The trainers have the same engagement and encouragement as a normal class environment. Response: From a client perspective, people don’t like the lack of demos or the uncertain start/stop which they find makes motivation a challenge. Everyone is different – I have to admit it doesn’t phase me really but I do understand why some people haven’t been thrilled with the formal. Response: Yeah, well, you have to try different things to see what works. 3-minute rounds was creating a 30-minute lap and most participants were doing 1-lap and leaving (10 stations). On a ‘normal’ 3-minute rounds day, the class would be 14-stations…the 90-seconds was a change to create a bigger, longer lap and hopefully extend a few workouts/change the perception that the class is ‘one lap’…it isn’t supposed to be that way. Answer: It’s good because it enables you to train for longer than a single class if you want to go for longer but be less intense. Response: Or train shorter and be more intense! Answer: You can start and stop when you like! Response: Your workout, your outcomes. Answer: I love it because it gives flexibility. You can do some weights beforehand or whatever then join in after. Response: This is where it is hard – comment earlier was people are being ‘forced to start’ as soon as they walk in…now it is a no stress start where you do some other stuff, then the class for a while…is it any wonder the little hair I have left is grey! Answer: I like rolling thunder as it allows me to continue for an hour. I find i struggle after 45mins & I get to push myself for another 15mins. However, rolling thunder or not I’ll still be there on a Thursday morning :-). Answer: I did like the 90seconds rolling thunder but thought the time made it a lil confusing. Response: Sure…I have to admit, I thought after you had done one station it would be completely obvious what to do/when to move on…as it turned out, for some people it was, for others, well, not so much. Living and learning. Answer: You get the opportunity to do a longer work out. Response: Or a shorter workout! Answer: I love it but I come at 6am and leave at 6:45 it’s not really any different to a normal boxing class. Response: I was trying to start it as soon as Body Work finished (around 5:45am)…but there was a bit of negative reaction to this (‘what time does it start?? ?’) so I settled on 6am…maybe I should roll from 5:45am/5:50am or so again! Response: OK – not sure what this means…does it mean it doesn’t drag on the second lap? Please reach out and let me know so I can make any adjustments you need. Response: That’s great. That extra 15-minutes is an extra 13 hours of work over a year…that has to be of benefit! Answer: I don’t mind either way but for someone who performs better having a strict start and finish time a normal boxing class is my preferred. Response: Yep. I totally get that…and we are still doing that on the other 6x days of the week. Response: Answered this one already…there is a vocal minority for 1-minute rounds…if people had been attending the sessions, they would still be running. Still my personal favourite class but when people aren’t attending the sessions, I HAVE to change it. Answer: I find going for longer during the session is better for me. 1 hour instead of just 45 minutes. Answer: Like the flexibility of getting there and starting at anytime and going for longer than 45 mins if feeling good! Answer: I don’t mind either way, keep it or scrap it. I don’t think its any different to a normal class in terms of what you get out of it. Answer: I enjoy the flexible start times and it just ‘changes up’ the normal gym class routine. Love it! Answer: Always a great variety in the classes but the rolling thunder allows a little flexibility for those who work and can only do part of the class. Response: Agree – that’s the idea! Response: Glad it is working for you. Answer: Just means I can go whenever I’m ready rather than waiting for the next class. Response: Hmmm. There is always SOMETHING you can get going on…have to admit, if you have been coming to the gym for more than a couple of weeks you should be able to actively fill in a few minutes (or 20!) whilst you wait for the class to start…. Answer: I don’t hate it but I prefer the classes more. You know how many times you have to go round and once the class has finished your done. Response: Yep – I get this. Response: At least you think it is organised. I am not so sure! Answer: I LOVE IT as can get to shops before or pop a few errands in prior – which normally I can’t make as rushing just to make 5pm class. Plus I can do an extra long workout or shorter workout depending if I can’t make weekend sessions. Response: Awesome – that’s the entire reason we have it. Response: 100% it isn’t early as 5am…my stupid alarm goes off at 4am every day. Answer: Helps me fit training in when I can…… absolutely love it!! Answer: Get to start training that little bit earlier. Have the mental battle of not quitting early and feeling good about yourself when you don’t. Response: Is DON is Good! Question 3: While we’ve got you, is there anything you would like to share with us about your overall experience at Round 1? Answer: I love the gym and looking forward to the extension! Response: Thanks for saying that – hopefully we can make the extension meet your expectations. Answer: The best experience I believe about Round 1 for me has been that you never know what your going to get when you go to a class. The added bonus is the different personalities you get to know in your class makes the whole experience enjoybable even the days you feel you could just simply stay in bed. Response: Thanks. I am not so convinced on the use of word ‘enjoyable’…but I had a couple of bad training experiences last week involving barbell thrusters, bike sprints and burpees! Answer: Love it. I’ve tried a whole heap of gyms and I just can’t get results without a very expensive PT session. At Round 1 I can have a group PT session and everyone motivates each other. Thank you!!! Response: Well…results come from effort. As much as I would love to take the credit for this, the results you have been attaining are 100% down to the effort YOU have been putting in. Answer: Best gym I’ve ever joined! Response: Awesome. Let’s hope we keep it that way. Answer: Thanks Mike, you’ve created a great place! Response: LOL. Don’t think I’ve done much. The members make the gym! Answer: Love the conditioning. Would also like to suggest to introduce and family day where a parent can bring their kid in on a weekend to train with them. Response: Cool…but parents can (and do) do that all the time??? Answer: Can’t keep me away ! Response: That’s how we want it to be. Response: Cant take credit for this stuff – your willingness to show up and do the work is what is behind the change. Answer: I absolutely love Round 1 and wouldn’t change a thing, we’ll maybe no burpees! Response: Burpees are great when you do them. Not so great when I have to do them. Answer: I love it! It’s the most supportive, community friendly gym I have ever been to. The gym challenges you whilst providing the support you need to succeed in your fitness and health goals. Response: Thanks. I hope we do provide the support you need. Response: Mostly to try and challenge you mate…one day I will come up with something that pushes you harder than you push yourself! Answer: Love Round 1 keep doing what you’re doing. You’ll never get rid of me. The body scanner is my fav so I can keep myself on track. I can’t always see changes physically but the scan always shows I’m doing something right. Response: If only I hadn’t broken the body scanner and could actually get it working…so sorry about the dramas we are having at the moment. Answer: You already know it is the best gym and fitness community! I know that if I fail my diet or attending classes that I can still come and be supported by trainers and members. Response: I hope we are supportive – that’s the way it is supposed to be…not sure we always live up to it though. Answer: Fun classes, Good vibes, Great coaches, Amazing members. Response: The members make the gym 100%. Have always said that…I’m just along for the ride. Answer: If someone is new for example their first week they should wear a newbie armband or something like that ,so the group they are in can give them handy advice . Response: Good idea. We have been introducing new people to the classes…has this helped?? Answer: The gym is awesome! The classes are fun & challenging & the trainers are fantastic. Answer: Awesome place… will never train anywhere else again! Response: Has to be right? We are all in this together – and together in trying to set a positive example for our own friends and families. Response: LOL. Thanks to the trainers I think. If they listened to/only did the things I wanted them to do the place would probably be very different! Response: Yeah – have to say, on those days when it is hard to even think about getting a session done, the guys all make it seem like a ‘FUN’ thing and something I should WANT to do. Answer: Love it and missing it. Response: Can I assume I should be saying that we miss you too? Answer: Love round 1, such a great place to train! Answer: Would love if it stayed open saturday and sunday arvo so if you couldn’t get in that morning you can still train. Response: So…I guess the only question I would ask is how much would you be willing to pay for this? Reach out and let me know…Happy to do anything but in simple terms another 10x hours per week translates loosely to $20k in wages per year (actually probably a bit more when you factor in Super)…as with all this stuff, it just becomes a really simple C-B analysis – I want everyone to be able to get in the sessions they want but DO need to pay the bills…my take is that there would be very few people wanting to train on Sat/Sun avo but more than happy to discuss it and reach out to the members more broadly to ask the question. Answer: You guys are great! Terrific trainers really good interesting sessions. Really enjoy the sessions and the way they constantly change. Different things such as Spartan also really mix it up. Response: Hopefully (hopefully) the upcoming expansion will allow us to throw more of these ‘wildcard’ style programs (such as Spartan) into the mix. Answer: Great place to train loving it! Answer: I love the gym. I’, not worried about perkville going etc, I’d rather pay a little more and lose a few perks, than lose the gym. Response: Thanks for saying that. Wish I could have kept the bonus scheme going but there has been a bit of a change in the back-end cost structure that has made it unsustainable…happy to talk specifics if you want to have a chat about it. Answer: I love this place. My first (and only) gym membership And I’ve been coming for 6 years. Response: As I said, Burpees are fine when you have to do them…not so great when I have to do them! Response: 100 pushups sounds like an awesome way to build strength in your chest, shoulders and arms. What an awesome idea adding that into the class was…unluckily, I must have missed Eden’s class! Answer: Love it. Love the people. Love the culture. Is it worth having kids or teenagers classes tailored to their growth and ability? Might even get you more family memberships signed up? Response: Thanks. We are supposed to be there to support YOU and your goals…please be sure to speak up if this ISN’T happening. Answer: Very positive, could however emphasise more time on boxing techniques in the boxing classes. Response: Yep – 100%. I do get a bit frustrated with this as no-one ever wants to do any of the technique sessions we run but…yep – basically I agree with you. Answer: I’ve been coming for over 6 years and I’m not bored yet. It keeps evolving and offering more. Keep going as you are. Response: Thanks so much for all the support. That’s amazing. Response: LOL. Not so sure about the gym being amazing – it is the members who make the place – but I’ll take it! Response: 7 years? Amazing. You should move in! J Thanks for all the support. Answer: Awesome gym, awesome people, awesome staff. Answer: Best gym in Perth! I drive 30min each way just to get there when I can…that’s saying something. Keep up the fab work. Response: That’s such amazing commitment…thanks so much. Answer: I really enjoy coming here. The trainers are great and it has that friendly atmosphere about it and the classes set are great. Response: Have to say, it’s what I worry about the most with Rolling Thunder. Having headed off to trial similar sessions at other gyms before implementing it at Round 1, I was really disappointed at just being left to my own devices…You have to remember, the sessions at R1 are supposed to be like that of a sports team – you all come in together, the coach explains the session to you, explains what they are looking for and then you work through it together. Rolling Thunder – by its very nature – breaks pretty much ALL of those rules! So me ‘staying involved’ (and I get there is a balance here – when I am training I too just get in the ‘can you please just let me do the circuit’ mindset) is really just an effort to keep one of the key principles of our sessions in place…Anyway, appreciate the comments and the feedback. Answer: Love the rawness, the vibe and culture of the gym. Response: Me too. Wish I could take credit for it! Answer: I’ve made it clear that I love the place and can’t fault it…. Response: 2 years? Thanks for all the support – we really are grateful that you keep choosing to train with us and hope you remain a member for a long-time to come! Response: Not so sure about that – but sure as hell chasing it. Response: Cheque is in the post – let’s keep the ‘how much’ ? between the two of us though! Answer: Bloody great gym 🙂 !! Answer: I love it. Such a great varied group of people who come together to get fit and have a laugh. Always leave feeling good in my soul! Response: Yep. It is like the old ‘I went to the fights and a hockey game broke out’ joke. I train at Round 1 for the fun and banter…the exercise it just a side benefit. Response: Sure – but if he did we would miss out on things like his famous “I’m stuck in the mud” comment whilst he was supposed to be doing bike sprints! Answer: Don’t recalibrate the bikes again or if you do drop the calorie targets! Not really its a great place to exercise. Response: OK. I will start with a serious answer. The bikes actually have to get calibrated and it happens all the time – the bike-ergs have ‘self tensioning’ belts that control the resistance and we have to continuously calibrate them. The problems we had a few weeks ago were exactly that – problems – and the issue was finally resolved by upgrading all of the bikes to a beta version of the microcode (I would guess we are still the only gym in the world running this software level)…we certainly didn’t WANT them to suddenly get way harder meaning all of the targets were close to unachievable. On a more light-hearted note, how come whenever one of the bikes is HARD it is because “Mike recalibrated it” whereas if it is EASY no one says “Mike recalibrated it”. All the blame, none of the credit! Sheesh. Answer: I’m not really looking forward to the new side of the gym opening up. I’m worried it will end up turning long time members away from the gym that like the gym just the way it is at the moment. Not sure what kind of people the new gym will attract either. If it ain’t broke don’t fix it! Response: So. I’m not really sure how to answer this one. I guess I will start by saying that I hope you have a little bit of faith in me to create a positive environment…but there is 100% something to what you are saying. The problem is that to do some of things we want to do – like the Spartan program, Developing Athlete etc – as well as support a number of members who rarely do boxing classes but DO love to train at our gym…well, we need more space. In theory, for people who do ‘Boxing’, ‘B+’ and ‘Body Work’ sessions today, nothing should change – except that we will have MORE SPACE to move around (because the power racks will move next-door). For people who want to do ‘other stuff’ – be it CrossFit style functional training, Lifting, Tanks Classes, Spartan etc – they will be able to do so in a ‘bigger’ space (and we will ask them to pay for the privilege of doing so). I honestly don’t know how it is all going to look or how it is all going to turn out – I guess we are trying to create more of a ‘full service’ business that can support people right through their fitness journey…but yep, I hear (and 100%) share your concerns. I cannot believe the increase in the level of debt I have taken on to create a facility that – as you point out – a percentage of people don’t even want…Anyway, I could go around and around on this forever…reach out so we can have a chat. Answer: I love the friendly fun atmosphere and definately look forward to coming in and pushing myself to achieve my best. Response: Fun, Interesting, Bloody hard work…that should be the new slogan!!! Response: Thanks – appreciate the support you give us. Answer: Love Round 1. I’m hooked!! Response: Thanks – as I sort of said before, I am more stressed and nervous than excited but hopefully we can create an environment that will be the envy of everyone! Answer: I do have one question though, will you be running the DAPs programme again? Response: Yep. As soon as we can get next door open and create room for the program. Answer: Is my second home. And there is no place I would rather be. Response: So nice to here things like this! Response: Our members drive the gym – THEY are fantastic…those of us lucky enough to work at R1 are just along for the ride. Response: Thanks so much for saying that. Response: J and we love you back! Anyway, that’s it for the survey Q+A. Good luck to everyone doing the challenge…see you all in the gym!